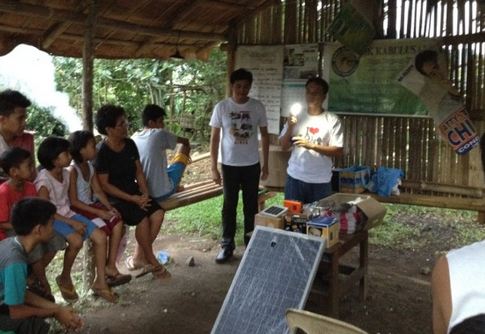 Hapinoy Solar Charging offers renewable energy solution through partner sari-sari stores in rural areas. Not all sari-sari stores are created equal. If you happen to see one equipped with solar-charging panels, then it’s sure to be a Hapinoy Solar Charging Station. Sari-sari stores, which sell varied goods, can be “transformed into a change agent that serves as market channel of solutions” for the poor, says Mark Ruiz, co-founder and president of Microventures Inc., the social enterprise behind Hapinoy. This program, begun in 2007, empowers store owners (mostly nanays or mothers) by providing microfinancing, training, and cheaper access to goods. With the help of microfinancer Center for Agriculture and Rural Development (CARD-MRI), and utilities giant AboitizPower, Hapinoy stores rent out solar lamps, on a per-day basis, in areas with limited access to electricity. “They’re able to earn income through the daily charging of lamps,” explains Julius Alip, deputy director of CARD-MRI’s business development service unit. Stores have also extended business hours after dark. The pilot phase began in 2012 with two charging stations in Makban, Laguna. Based on the results, the group has developed a sustainable—and replicable— business model. With about 15 additional charging stations in 2013 (and more thereafter), the future is bright for Hapinoy. This article was originally published in the June 2013 issue of Entrepreneur magazine (with updates from the editor). Subscribe to the print or digital version here.